Marco Silva hailed Lucas Digne after the in-form left-back's last-gasp free-kick salvaged a point for Everton against Watford. 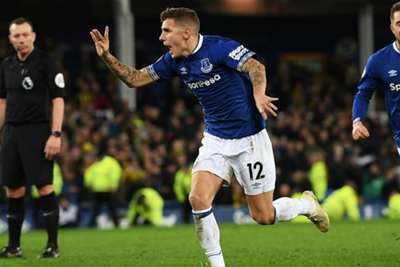 Former Barcelona defender Digne secured a 2-2 Premier League draw courtesy of his dramatic 96th-minute set-piece at Goodison Park on Monday. It was Digne's first goal for Everton since the France international left LaLiga champions Barca in the off-season and Toffees manager Silva heaped praise on the 25-year-old. "It was a fantastic moment for him," said Silva. "He showed not just his quality but his personality as well as a player when he took that decision [to take the free-kick]. "Maybe everyone was expecting it to be Gylfi [Sigurdsson] because it is a good decision for a right-foot shot. "But Lucas has done well and it was a very good moment for him and to help our team." While Silva lauded Digne, the Everton boss was unhappy with his team's performance in the second half after they surrendered a lead. Richarlison put Everton ahead in the 15th minute, but a wild two minutes past the hour-mark saw Watford score twice via a Seamus Coleman own goal and Abdoulaye Doucoure. Gylfi Sigurdsson then had a penalty saved by Ben Foster with 22 minutes remaining before Everton team-mate Digne rescued a point for the home side. "I told the players that I didn't like our second half," Silva added. "It was not a normal second half for us. We have to display our quality on the pitch a bit more, to play our way and try to score the second goal. "In the first half we did well, playing our way, trying to score and creating chances. We had speed in some moments in our game. But after we scored the first goal, the game didn’t have the control we wanted. "We cannot concede two goals in two or three minutes. In those two moments, we have to do differently. "But we kept trying to create chances and we did with Richarlison, the penalty and others. But thankfully we got the equaliser right at the end."